Just to kick start this thread again, which still gets viewed by a number of you (thank you! ), this is from a discussion on the old Rider Dairies. It involved the late Rich Stiller who worked for Westchester DOT and had to do with how the various buses display destination signs on Bee-Line Rt 1. There are three branches to Route 1. Routes 1C (Westchester County Medical Center), 1T (Tarrytown) and 1W (White Plains). They all serve the W. 242nd Street subway terminal in the north Bronx. They all operate on South Broadway and Warburton Avenue to Ardsley. Then 1T and 1W continue up Broadway to Tarrytown where they split. The 1T continues to the Tarrytown Metro-North station while the 1W turns east on Rt. 119 and goes to White Plains. Meanwhile, back in Ardsley, the 1C goes east on Ashford Avenue, then north on Saw Mill River Road to the WCMC in Valhalla. As Rich explained, the destination signs on each bus should contain the letter of the route, including on the southbound runs where all three display the same destination "W 242 ST Subway." 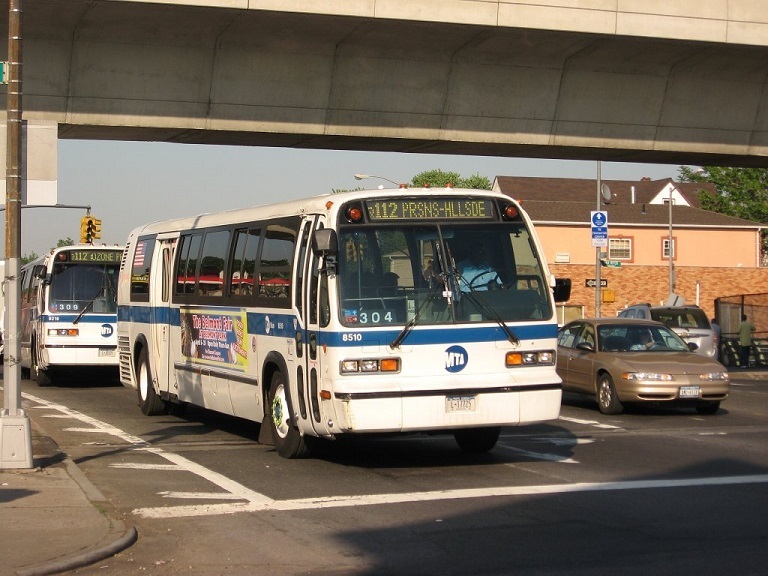 The only buses that should display "1 W 242 ST Subway" are short turn 1s that operate north to the Yonkers/Hastings city line. Below are some cell phone pix I took, on the way home from work, of the destination signs of a few 1s in January and March 2012. 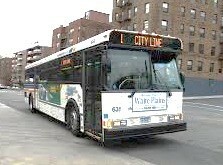 A Neoplan Artic on a 1W run at Elmsford Square. This was the one Rich Stiller said was missigned, that it should have the letter designation. I didn't think about it at the time, but it occurs to me now that the Artics may only have that display. An Orion V on a 1W run, also at Elmsford Square. It was pointed out the sign only had one 'W.' For the route, not the street. This is a Bronx-bound NABI on a 1C stopping at Sam's Club in Elmsford. Note the small case C and the inclusion of "W" in the street name. Thanks, Tommy, for something I had not noticed: the use of West before 242nd Street on the destination sign. In ordinary talk (growing up near West 225th Street), we almost never used West or East. It took John McNamara's book, Streets in Asphalt, to force me to use those prefixes. He consistently alphabetizes his work with the East or West, not just Fordham Road, but West Fordham Road. It's a good habit, as house numbers repeat in many cases, east and west. For that reason, I tend to call the #1 train terminal Van Cortlandt Park and the #2 terminal Wakefield! Bus riders in Westchester just might become confused by the 241 and 242 huge difference, four miles, with East 241 also somewhat closer to the North Pole than West 242! I would like to call the #1 terminal Manhattan College, but the college moved to The Bronx. I found this photo on Google. When I clicked to see who took it, it came back "image disabled." Too bad. It shows a short-turn No. 1 with the "1 CITY LINE" destination sign. Looks like it's operating northbound on Broadway in the north Bronx at W. 262nd Street very close to the Bronx/Yonkers city line. Of course the city line the sign refers to is the Yonkers/Hasting city line on Warburton Avenue. As the late Rich Stiller pointed out, this branch of Route 1 was the only one that was correctly signed when it was showing a destination without the branch letter. If I can find a photo of a northbound #1 Yonkers Railroad street car, it would be interesting to see what the destination read. I don't recall it, though Dad brought me several times to the end of track on the #1 where a bus would be waiting for connecting passengers. Being trolley fans, we paid the fare to return south. Only in the recent four years have I traveled Warburton Avenue by car and managed to find (I think) the places where the route was single-track. The 1 City Line sign is certainly confusing to a person boarding at West 242nd Street! Postscript: A quick run through the #1 photos on nycsubway.org show that the photographers, like I, prefer photos of southbound cars, not northbound, because of the sunlight. All the destination signs are southbound, SUBWAY. How about Mack 160 in this photo with a clear roller sign 1 CITY LINE? That makes me think the streetcars used the CITY LINE destination for the Yonkers-Hastings City Line. 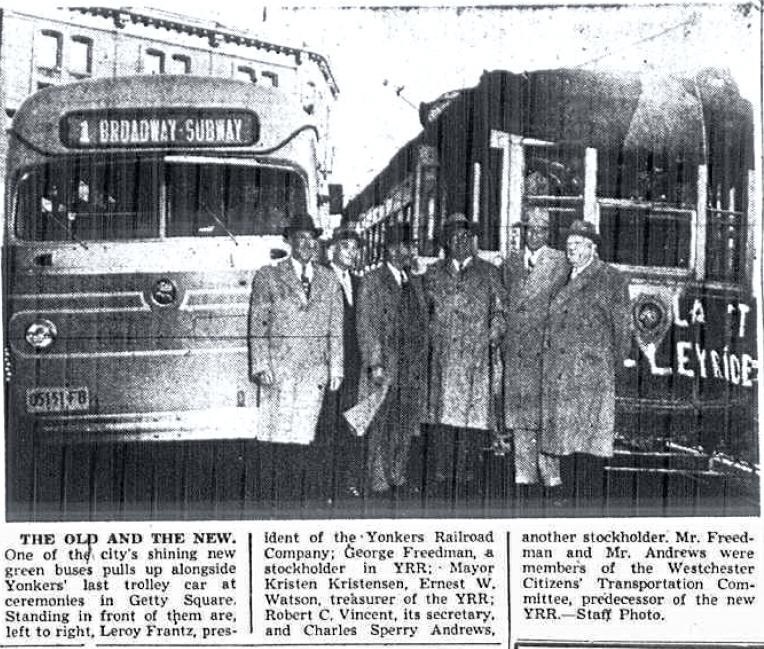 From the November 11, 1952 edition of the YONKERS HERALD STATESMAN. 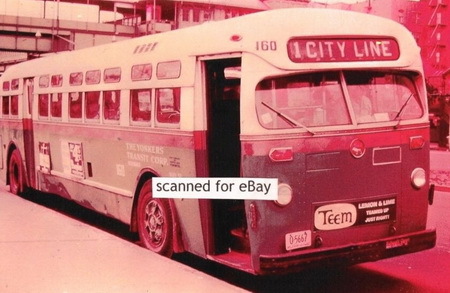 The link was supposed to go to one specific photo, but instead it went to the entire Google collection of "Yonkers trolley" photos. When requesting a specific topic in either Google or Bing, the search widens and displays photos from a wider and wider category. I will try again! At starting point, West 242nd Street & Broadway. Obviously, the destination is not the City Line of West 262nd Street but where Warburton Avenue enters Hastings. Thanks for the photo Joe. Route 1 didn't have branches originally, back when Yonkers Transit was in business. 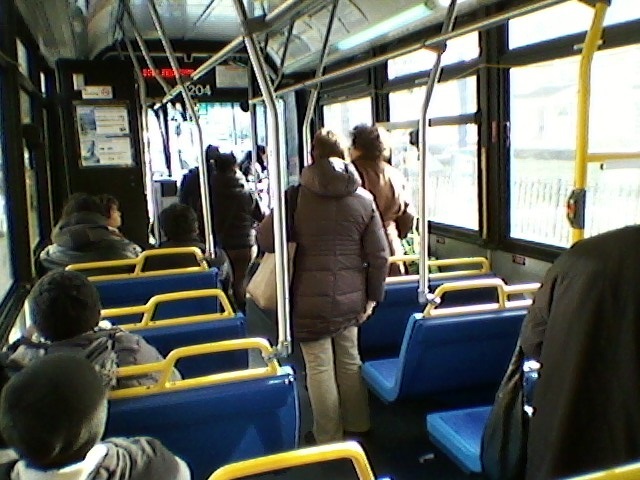 The buses operated to Hastings (the next town north of Yonkers on Warburton Avenue) and 1 CITY LINE was a short turn route. It was Bee-Line that extended the route to Westchester County Medical Center (1C), to Tarrytown (1T) and to White Plains (1W). This was back in the 1990s I think. I had a news article announcing the extension which I haven't been able to find. 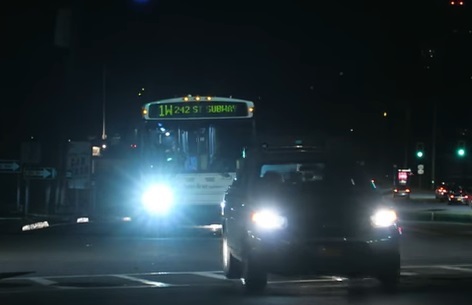 Btw I'm attaching a screen grab from a Youtube video showing a Bronx-bound Route 1W bus on Tarrytown Road (Rt. 119) approaching Hillside Avenue. 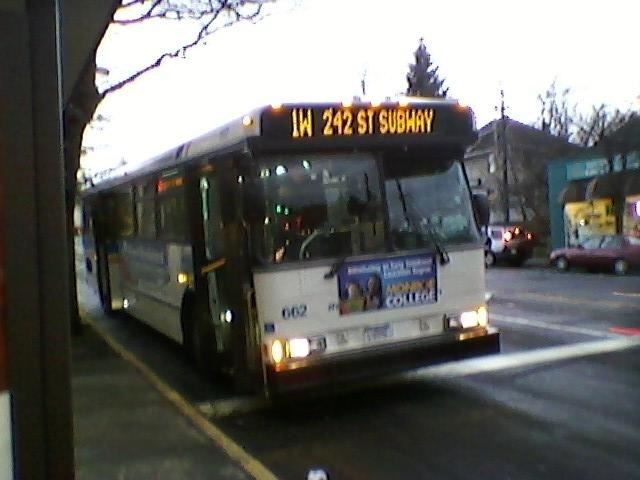 The bus is an Artic and the destination sign does show 1W 242 St Subway, not just 1 242 St Subway as I had previously seen. Not the greatest image but it does illustrate the point. As the late Rich Stiller of Westchester DOT once commented, if a Route 1 bus is operating on one of the branches the destination sign should include the branch designation at all times. A Bronx-bound Route 1W bus on Tarrytown Road (Rt. 119) in Greenburgh approaching Hillside Avenue. A couple photos of the Orion 7 low-floor hybrid buses of which Bee-Line has four (201-204). Bee-Line has had two groups of Orion 5 high-floors, atotal of almost 200 buses. The late Rich Stiller of Westchester DOT said that in 2006 when the County wanted to start buying low-floor hybrids, they naturally turned to Orion. But I think the four they acquired were really demonstrators, a pilot project. By 2008 they were ready to place a big order but North American Bus Industries (NABI) was low bidder. Against the advice of many in DOT, Rich said, the County acquired 95 NABIs (205-299). I think they have turned out to be good buses, though. This is from Wiki so I don't know the date. But it's a Bronx-bound No. 25 stopping on North Broadway at Getty Square. The route runs up No. B'way to Ashburton and, eventually, to White Plains Road in the Bronx via the Cross County Shopping Center. I have read that when the MTA bought the Bee-Line Orion V (401-484), that they were also thinking of getting these 4 Orion hybrids. First, Bee-Line is not a part of MTA. 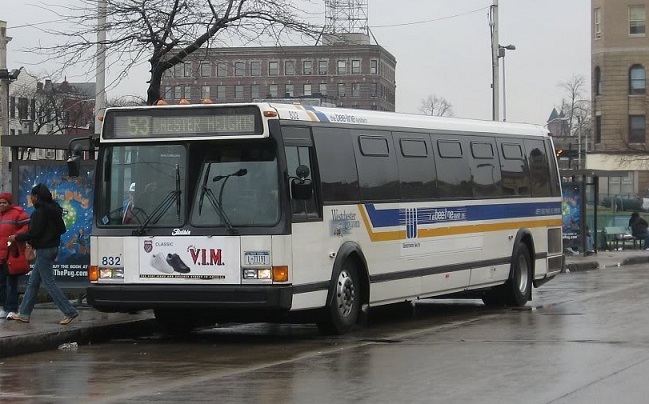 It's a Westchester County operation, funded by Westchester DOT and operated under contract by Liberty Lines Transit Inc. Second the Orion V 401-484 were acquired in 1995 long before the four Orion VIIs were bought. Did you mean when Bee-Line bought the current fleet of Orion Vs, 601-704? They were bought in 2006 (mostly to replace the Flxible MetroB fleet, 760-879) and it was at the same time Bee-Line got the four hybrid Orions. The late Rich Stiller was a Westchester DOT official during that time period, involved in acquiring equipment, and he wrote quite a bit about it on the old Straphangers Campaign Rider Diaries. Unfortunately all that information has been lost because of the decision to take the Diaries down. Bee-Line Metro B Flxible at the stop serving Metro-North's New Haven Line station in Mt Vernon on a No. 53 (to Eastchester via South Mt. Vernon and Pelham). 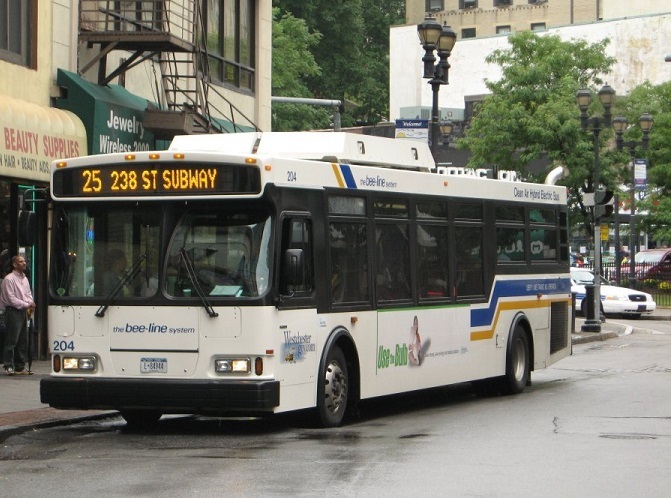 I am talking about the MTA's purchase of the BeeLine Orion V #401-484. They ran under the MTA as #101-184. I read on BusChat that the MTA had been thinking about acquiring the 4 Bee Line Orion VII as well, but that fell through. Okay now I understand. I recall Rich Stiller of Bee-Line (Director of Operations) expressing his surprise that MTA Bus wanted the 1995-1996 Orions. I'm sure the County was very happy to sell them. I rode them all the time and they were still in good shape. I've read that MTA Bus wanted them to replace older TMCs. The former Bee-Line buses went into service around 2009 and were mostly all retired by 2014. 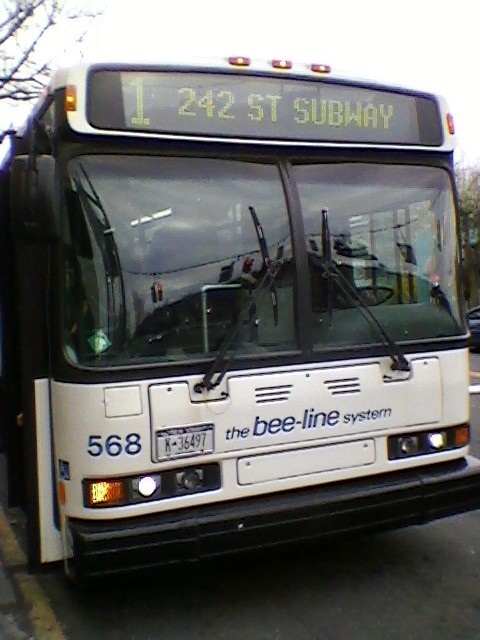 Former Bee-Line 430 on a Q45 run, a former Triboro Coach route. The route was incorporated with the Q47 in 2011. 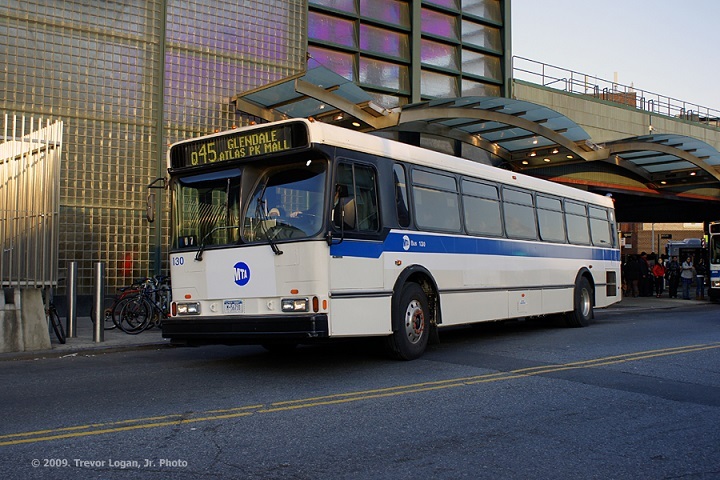 This is a photo of 1993-built TMC 8510 operating on the Q112 in Queens. This was the type bus the Bee-Line Orions replaced though I'm not sure if 8510 was one of them. Thanks, Tommy, of the photos with explanations, events I have little memory of. This discussion board is great, partly because people clarify, explain, then post superb photos!